WASHINGTON (CN) – Bringing to a close a week of increased concerns over conflicts of interest in the president-elect’s family, Donald Trump took to Twitter Friday to complain that getting elected is stopping his son’s charitable work. Eric Trump told the Washington Post on Thursday he would stop accepting new money into the Eric Trump Foundation’s bank account, after reporters began digging into a fundraiser the foundation’s official Twitter account promoted for the children’s research hospital St. Jude’s, auctioning off coffee with Ivanka Trump. Ivanka is supposed to inherit the Trump business but has also been sitting in on diplomatic and policy meetings with her father. The president-elect himself has dodged inquiries about his conflicts of interest with the same aplomb by which he rebuffed demands for his tax returns. A press conference Trump was supposed to hold on the issue was canceled, without explanation, and never rescheduled. Trump has not held a press conference since July, when he called on Russia to hack Hillary Clinton’s emails. 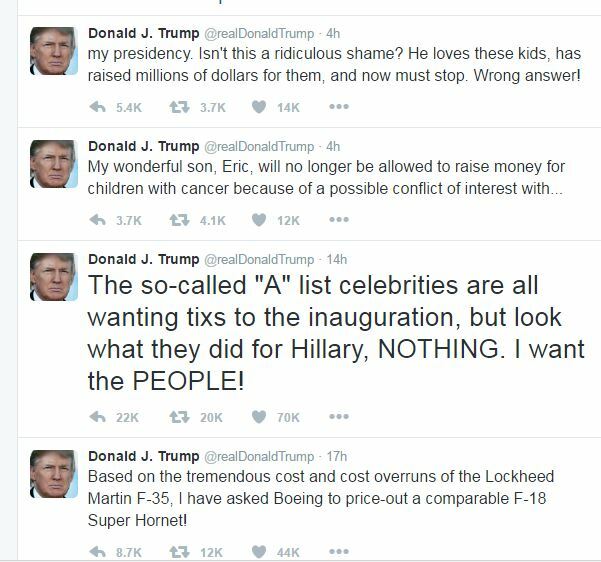 Calling the outcome of his son’s charity unacceptable, Trump took to Twitter on Friday. Eric’s decision followed revelations earlier in the week that he and his brother, Donald Trump Jr., had ties to the Opening Day Foundation, a Texas-based conservation nonprofit that was apparently offering access to the future president and his family as incentives for donors. The group had offered large donors a “private reception and photo opportunity” with the president-elect as well as a hunting and fishing trip with Eric and Donald Jr. The presidential transition team initially denied the family’s involvement with the charity, but documents published by The New York Times showed Eric and Donald Jr. were listed on the organization’s board of directors. During the campaign, Donald Trump repeatedly hit his Democratic opponent over allegations that, while serving as secretary of state, she gave better access to people who donated to her private foundation. Calling the Clinton Foundation a “slush fund,” Trump and his surrogates used it to boost his core message that Clinton was a corrupt member of the political establishment.